Here at supercounters, we offer a variety of widgets such as hit counter, flag counter, and users online counter. You can access your real-time web stats from anywhere at anytime. With our state-of-the-art dedicated server and fast network connection, your counter widgets will always be available. How many visits does your website receives hourly, daily, weekly, monthly, and yearly? Which country do they come from? How many visitors are currently viewing your site? What search terms or keywords are they using to find your site? Widgets are free and no email required. Simple Installation takes only a few minutes. Reliable hit counter over 100 different counter styles available. Shows how many visitors you have online and always stayed of the page. You can find out how many visitors are online at your site in real time. Displays the geographic location of your visitors in real time. 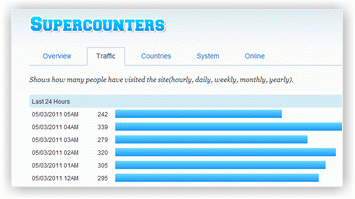 Shows you the total number of visitors from each country. IP address lookup widget shows the visitor's geographic information. With our browser extensions you can see the current online visitors in your site even though you are surfing other website. Shows your internet ip address and information about an ip address including location, ISP, hostname. Free Tools to help webmasters and web developers everywhere optimize the performance of their websites. Ping - Ping a server or web site using our network worldwide.